President Trump seems ready to declare victory in his effort to make America great again; last month, he said the slogan for his 2020 re-election campaign will be “Keep America Great.” But how much has really changed, particularly for the “everyday, working Americans” whom Trump said were the “backbone and heartbeat of our country” — and whose votes helped him secure the presidency? Recent decades have been cruel to working-class Americans, a group I’m roughly defining as the 84 million prime working-age1 people in the U.S. who lack a college degree. But in the first year of Trump’s presidency, there was some good news. Workers with high school educations finally saw a sizable wage increase after years of scant growth. The economy added more than 200,000 manufacturing jobs, something that was unimaginable a decade ago when cheap imports from China put around a million Americans out of work. Zoom in and this story about the turnaround of blue-collar America gets a lot less clear. That’s partly because it lumps together large swaths of the population — rural and urban residents, white and black people, men and women — in a way that obscures the sometimes-gaping fissures between these groups. And the hidden reality doesn’t always match up with the way politicians talk about blue-collar Americans, particularly when it comes to the plight of rural America and embattled white men. Think the rural heartland is the struggling core of modern America? Actually, America’s middle has been outperforming the coasts for decades. And while Trump’s ascendance has shined a spotlight on the plight of white men left behind by a changing economy, they still enjoy vast advantages over blue-collar black and female workers. If you gather all of rural America into one homogeneous blob, the story looks bleak indeed, with the population shrinking as job growth lags. But this rural vs. the rest approach muddies the picture more than it reveals — because the experiences of rural areas vary widely across the country. Look to rural areas elsewhere in the country, and it’s a different story. 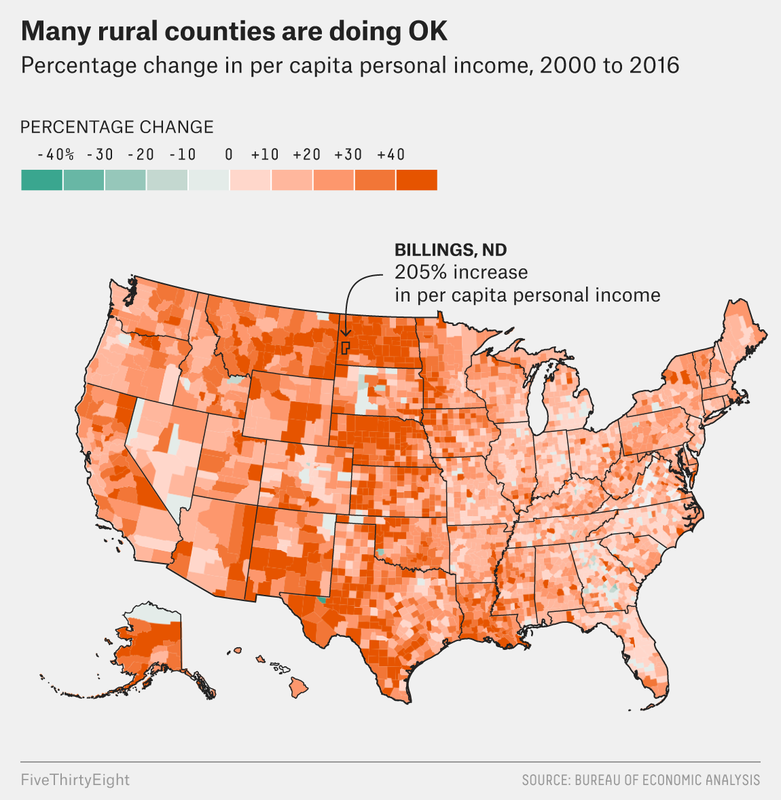 The median change in per capita income for the rural counties in the band was 38 percent, compared with just 21 percent for all the rural counties outside of that area. Only two rural counties in the entire area that stretches from Mississippi across to Florida and up to Delaware6 even crack the list of the top 200. Nebraska alone has six in the top 10. Looking at average incomes in this way has limitations, though, because it tells us nothing about distribution. Gains could have gone into the pockets of a highly educated few while everyone else was left with crumbs. But that doesn’t seem to have been the case, at least not in that high-performing band of states in the middle-west. If you look specifically at wage gains among low-wage workers7 — instead of per capita income as a whole — the states where people saw the biggest wage increases from 2000 to 2016 are North Dakota, South Dakota and Wyoming.8 Montana, Oklahoma and Nebraska are also among the top 10. Another way to see that blue-collar residents in these states are outpacing peers elsewhere is to look at employment rates.9 The Plains states — including North Dakota, South Dakota and Nebraska — stand out for having large shares of 25- to 54-year-olds without college degrees who are employed.10 As you can see from the map below, some of the weakest areas are in the southern parts of the country. Add race to the mix, and the story of working-class America fractures into pieces. Whether you focus on wages or employment, black workers seem to be struggling far more than white or Hispanic workers. In 2017, black workers with just a high school degree saw their wages fall, even as paychecks grew for similarly educated Hispanic and non-Hispanic white workers. And while Hispanics at every education level still earn less than non-Hispanic whites, the gap between whites and blacks is substantially larger. Black high school grads earn 78 cents for every dollar that white high school grads take home; Hispanic high school grads get 87 cents. Nationwide, 65 percent of 25- to 54-year-old black Americans without a college degree have jobs, well below the 73 percent rate for Hispanics and 74 percent rate for non-Hispanic white people. But the gaps aren’t uniform across the country. As you can see from the map below, some of the areas with the highest employment rates for working class blacks are in the South, a very different regional pattern than you see for white workers.11 In contrast, the Midwest remains a region of relative strength for whites even though it has become a kind of shorthand for working-class woes. Across blue-collar America, working-class men are a relatively privileged group, with prospects that are vastly better than those of women: At every education level — from those with less than a high school degree to those with some some college — men outearn women by at least 20 percent. These advantages are even more pronounced among white men. A recent paper from economists at Harvard, Stanford and the Census Bureau found that white men with lower-income parents12 tend to have incomes around $31,000, while white women with similarly paid parents earned just $23,000. Black women (and men) can expect a similar salary, between $23,000 and $25,000. And yet, even if they do make more than female and black workers, white men still aren’t able to outearn their parents — a bleak commentary on the American Dream. Simply finding a job can be a struggle. In 1980, about 88 percent of 25- to 54-year-old white men without college degrees had jobs; today, that number is 80 percent. Prime working age is generally defined as people who are 25 to 54 years old. There are other ways to define the working class, including using wages rather than education. According to data from the Bureau of Economic Analysis. Montana, Wyoming, Colorado, New Mexico, North Dakota, South Dakota, Nebraska, Kansas, Oklahoma and Texas. Resource extraction and natural gas fracking have played a large part in the success of the rural West. Defined as 18- to 65-year-olds with wage income at the 25th percentile. Data is from the U.S. Census Bureau’s American Community Survey, made available by IPUMS-USA, University of Minnesota. Including just the 50 states, not Washington, D.C., which did post substantial gains for lower-wage workers. In a recent conference paper, economists Benjamin Austin, Edward Glaeser and Larry Summers emphasize the importance of focusing on who works — and who doesn’t — as a measure of well-being. Based on an analysis of five-year estimates (2012-16) from American Community Survey public-use microdata, via IPUMS-USA, University of Minnesota. Again, according to ACS public use microdata. Parents with household incomes at the 40th percentile. Evan Horowitz writes the “Quick Study” column for the Boston Globe.